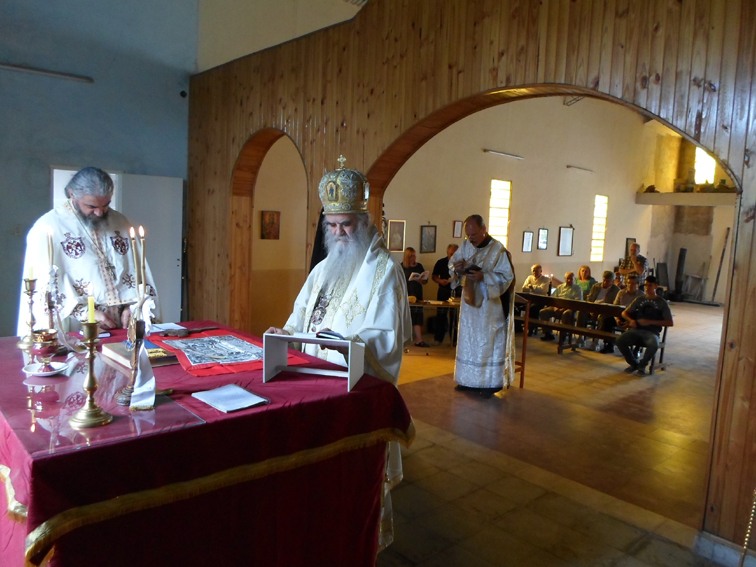 Diocese of South America - Metropolitan Amphilochius celebrated the Holy Liturgy in Venado Tuerto and a commemoration rite for Radojica Popovic in Aribeños. On Wednesday, 10 December, His Eminence Amphilochius, Archbishop of Cetinje and Metropolitan of Montenegro and the Littoral, Bishop-Administrator of the Diocese of Buenos Aires and South-Central America, served the Divine Liturgy at the church of Holy Archangel Michael in Venado Tuerto in Argentian province of Santa Fe. He was concelebrated by local clergy. Venado Tuerto is about 350 kilometers away from Buenos Aires and it has been inhabited by many immigrants from Montenegro. Some 30 people attended the Holy Liturgy, among whom there were families: Gvozdenovichs, Simonovichs, Rajkovichs and Fredericks. At the end of the Metropolitan’s sermon, the faithful received small Church calendars published by this Diocese for the forthcoming 2015, the second issue of the Diocesan magazine, Njegos’s famous epic “The Mountain Wreath” in Spanish, icons, small crosses and a pamphlet on Patriarch Paul of blessed repose, published on the occasion of 100th anniversary of his birth. Metropolitan Amphilochius with priests paid a canonical visit to Aribeños, where they served commemoration rite for late protopresbyter Radojica Popovich. Fr. Popovich came to Argentina in 1947, being send there by Serbian Patriarch Gabriel Dozich, and until his death he was the only priest of the Serbian Orthodox Church in Argentina serving as an envoy of the Serbian Patriarch as well. This priest died in Buenos Aires in 1960, and was buried there first, but later on his descendants transferred his remains to Aribeños. It was in this city that the Metropolitan met with Jorge Jovanovich, son of Ilija Jovanovich who was one of organizers of the local community of the Montenegrin immigrants. Accompanied by Mr. Jovanovich, His Eminence Metropolitan served commemoration rite on this cemetery for Ilija Jovanovich, as well as for other immigrants from Montenegro and their descendants who rest there.